Broadcaster Press 7 December 25, 2018 www.broadcasteronline.com There’s No Time Like Fair Time At The 2019 SD State Fair HURON, S.D. – The South Dakota State Fair has announced its 2019 State Fair theme – “There’s No Time Like Fair Time!” “The 2019 theme highlights the genuine excitement and energy people have for the fair. Fair time is a special time of year!” said Peggy Besch, South Dakota State Fair manager. “Whether you show animals at the fair or just come for the grandstand, there is something special about walking onto the fairgrounds for the first time each year. The blend of fresh woodchips, hot corndogs and sweet cotton candy rush your nose as you head to your destination, bringing back memories of nights running around the carnival or days with friends and family in the barns. There just simply is no time like fair time.” Each year the South Dakota State Fair boasts a variety of events including livestock shows, 4-H exhibits, carnival rides, free entertainment, and top-notch grand- Symposium During Dakota Farm Show In Vermillion BROOKINGS, S.D. - Southeast Research Farm in partnership with SDSU Extension will host a symposium January 3 and 4, 2019 during the Dakota Farm Show held in Vermillion. The Dakota Farm Show is held at the University of South Dakota, Dakota Dome (1101 N Dakota St.). Symposium topics range from the 2019 agriculture climate outlook and making the most of the tough markets, to the soybean midge, and best management practices for timing of corn N inputs. "We have some talented folks sharing their expertise on a range of topics that are of interest for the agricultural community," explains Peter Sexton, Manager of the SDSU Southeast Research Farm. The symposium will be held in a meeting room at the Dakota Dome. Below is the symposium agenda. No registration is necessary. Thursday, Jan. 3 10:30 a.m. Ag Weather Outlook 2019 and Beyond - Elwynn Taylor, Extension Climatologist, Iowa State University Noon Break 1:30 p.m. Emerald Ash Borer: What you need to know about this threat to our ash trees - John Ball, Professor, SDSU Extension Forestry Specialist & South Dakota Department of Agriculture Forest Health Specialist 3 p.m. Afternoon session ends Friday, Jan. 4 10:20 a.m. To Till or Not to Till: results of a long-term study at the Southeast Farm - Peter Sexton, Manager Southeast Research Farm, Associate Professor & SDSU Extension Sustainable Cropping Systems Specialist 10:35 a.m. Work with Annual Forages at the Southeast Farm - Sara Bauder, SDSU Extension Agronomy Field Specialist 10:50 a.m. Oat Response to N and Growth Regulators David Karki, SDSU Extension Agronomy Field Specialist 11 a.m. Break 11:15 a.m. Soybean Midge: a new pest in soybeans Adam Varenhorst, SDSU Extension Entomologist 11:30 a.m. Making the Most of a Tough Market - Jack Davis, SDSU Extension Crops Business Management Field Specialist 11:45 a.m. Timing of N Fertilizer Application in Corn - Jason Clark, Assistant Professor & SDSU Extension Soil Fertility Specialist Noon Break 1:30 p.m. Food Preservation at Home: canning techniques and freezing - Hope Klein, SDSU Extension Health Education Field Specialist 3:15 p.m. Afternoon session ends stand entertainment. The fair also hosts well over 400 vendors for fairgoers to visit. An updated State Fair logo has also been designed and can be viewed on the SD State Fair website, www.sdstatefair.com. The 2019 South Dakota State Fair will run from Thursday, Aug. 29, through Monday, Sept. 2. Channel Seeds preview night will be Wednesday, Aug. 28. For more information on State Fair events, contact the fair office at 800.529.0900, visit sdstatefair.com or find it on Facebook or Twitter. Agriculture is a major contributor to South Dakota’s economy, generating $25.6 billion in annual economic activity and employing over 115,000 South Dakotans. The South Dakota Department of Agriculture's mission is to promote, protect and preserve South Dakota agriculture for today and tomorrow. Visit them online at sdda. sd.gov or find them on Facebook, Instagram and Twitter. 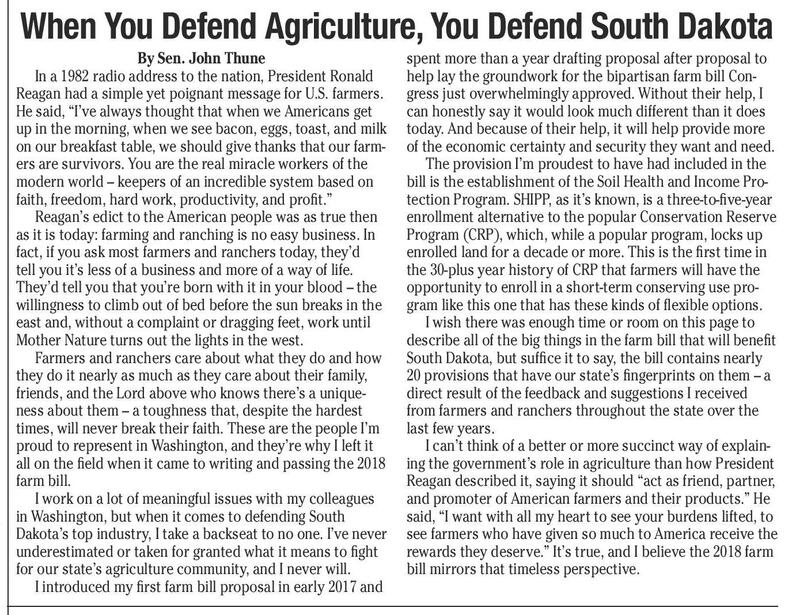 When You Defend Agriculture, You Defend South Dakota By Sen. John Thune In a 1982 radio address to the nation, President Ronald Reagan had a simple yet poignant message for U.S. farmers. He said, “I’ve always thought that when we Americans get up in the morning, when we see bacon, eggs, toast, and milk on our breakfast table, we should give thanks that our farmers are survivors. You are the real miracle workers of the modern world – keepers of an incredible system based on faith, freedom, hard work, productivity, and profit.” Reagan’s edict to the American people was as true then as it is today: farming and ranching is no easy business. In fact, if you ask most farmers and ranchers today, they’d tell you it’s less of a business and more of a way of life. They’d tell you that you’re born with it in your blood – the willingness to climb out of bed before the sun breaks in the east and, without a complaint or dragging feet, work until Mother Nature turns out the lights in the west. Farmers and ranchers care about what they do and how they do it nearly as much as they care about their family, friends, and the Lord above who knows there’s a uniqueness about them – a toughness that, despite the hardest times, will never break their faith. These are the people I’m proud to represent in Washington, and they’re why I left it all on the field when it came to writing and passing the 2018 farm bill. I work on a lot of meaningful issues with my colleagues in Washington, but when it comes to defending South Dakota’s top industry, I take a backseat to no one. I’ve never underestimated or taken for granted what it means to fight for our state’s agriculture community, and I never will. I introduced my first farm bill proposal in early 2017 and spent more than a year drafting proposal after proposal to help lay the groundwork for the bipartisan farm bill Congress just overwhelmingly approved. Without their help, I can honestly say it would look much different than it does today. And because of their help, it will help provide more of the economic certainty and security they want and need. The provision I’m proudest to have had included in the bill is the establishment of the Soil Health and Income Protection Program. SHIPP, as it’s known, is a three-to-five-year enrollment alternative to the popular Conservation Reserve Program (CRP), which, while a popular program, locks up enrolled land for a decade or more. This is the first time in the 30-plus year history of CRP that farmers will have the opportunity to enroll in a short-term conserving use program like this one that has these kinds of flexible options. I wish there was enough time or room on this page to describe all of the big things in the farm bill that will benefit South Dakota, but suffice it to say, the bill contains nearly 20 provisions that have our state’s fingerprints on them – a direct result of the feedback and suggestions I received from farmers and ranchers throughout the state over the last few years. I can’t think of a better or more succinct way of explaining the government’s role in agriculture than how President Reagan described it, saying it should “act as friend, partner, and promoter of American farmers and their products.” He said, “I want with all my heart to see your burdens lifted, to see farmers who have given so much to America receive the rewards they deserve.” It’s true, and I believe the 2018 farm bill mirrors that timeless perspective. Spearfish High School Student Offered Appointment To U.S. Air Force Academy WASHINGTON—U.S. Sen. Mike Rounds (R-S.D.) today announced Spearfish High School student Sierra Hillard has received a fully qualified offer of appointment to the U.S. Air Force Academy, which she intends to accept. Sierra is the daughter of Sue Hillard of Whitewood, SD, and the granddaughter of former South Dakota Lt. Governor Carol Hillard. 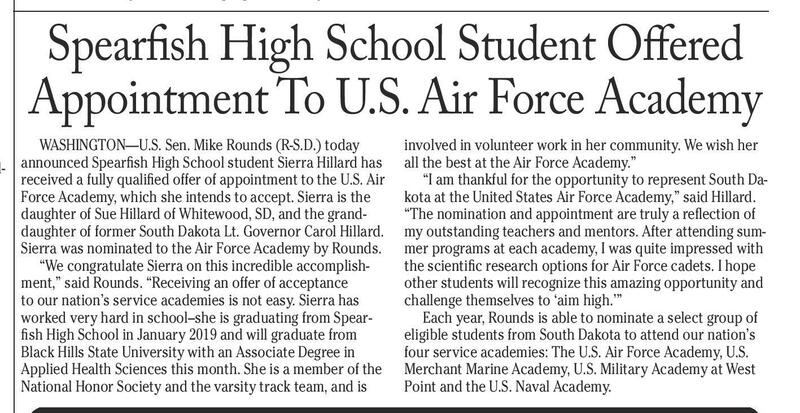 Sierra was nominated to the Air Force Academy by Rounds. “We congratulate Sierra on this incredible accomplishment,” said Rounds. “Receiving an offer of acceptance to our nation’s service academies is not easy. Sierra has worked very hard in school--she is graduating from Spearfish High School in January 2019 and will graduate from Black Hills State University with an Associate Degree in Applied Health Sciences this month. She is a member of the National Honor Society and the varsity track team, and is involved in volunteer work in her community. We wish her all the best at the Air Force Academy.” “I am thankful for the opportunity to represent South Dakota at the United States Air Force Academy,” said Hillard. “The nomination and appointment are truly a reflection of my outstanding teachers and mentors. After attending summer programs at each academy, I was quite impressed with the scientific research options for Air Force cadets. I hope other students will recognize this amazing opportunity and challenge themselves to ‘aim high.’” Each year, Rounds is able to nominate a select group of eligible students from South Dakota to attend our nation’s four service academies: The U.S. Air Force Academy, U.S. Merchant Marine Academy, U.S. Military Academy at West Point and the U.S. Naval Academy. SDSU Extension Encourages Families To Discuss Aging BROOKINGS, S.D. - As you think about yourself as an older person, what do you see? The answer to this question is likely very personal because everyone has different goals and priorities for themselves and their family, explained Leacey E. Brown, SDSU Extension Gerontology Field Specialist. "Many people find it difficult to talk about goals and priorities for aging," Brown said. "Many families have not discussed many of the important topics we often associate with aging, but that are critical for people of all ages." Preparing for how you want to age is a topic highlighted in a panel discussion Designing Your Future Plan, which was held during the 2018 Aging Gracefully Expo, hosted by SDSU Extension in Rapid City. The video is available for family's to watch together and discuss at this YouTube link. "Without conversations with family members, many could find themselves having to make difficult decisions they didn't have time to prepare for," Brown said. "The challenge is that many people do not know where to begin the conversation. That is where this video comes in." Topics discussed during the Designing Your Future Plan panel include: cost of care, strategies to pay for care, home modifications, advanced healthcare planning, downsizing and more. To aid the discussion, Brown developed discussion questions families could go over together after reviewing the online video. "Some of these topics are very emotional because we are talking about the end of our time here. It will take more than one conversation to develop a plan," Brown said. "This process is necessary so that families across South Dakota can have what matters most to them, no matter what challenges they face." Step one is to start the conversation. Below, Brown lists questions families should discuss together: 1.What are your goals and priorities for yourself and your family as you age? 2.What are the health or other challenges likely to present themselves as you near the end of your life? 3.Describe how you would like to receive care or assistance. Where would you like that care to take place? 4.With the cost of care ranging from approximately $25 an hour to $200 a day, how will you pay for care? 5.What circumstances might require you to receive health or long term care different than you planned? 6.What information do you need as you develop your plan to achieve your goals and priorities for aging and end of life? To learn more about this topic, contact Brown by email. The 2018 Aging Gracefully Expo was made possible because of generous support by the South Dakota Office of Attorney General and AARP South Dakota. Nursing Positions Patient Accounts Representative: Switchboard Operator: Immediate openings for full-time positions in Family Medicine, Float and Internal Medicine departments. Individual must have the ability to prioritize, adapt quickly to changing situations, and work efficiently; have excellent communication and computer skills. Must be flexible with schedule, display a professional attitude and be a “team” player. Must possess current South Dakota nursing license. All qualified applicants will receive consideration for employment without regard to race, color, religion, gender, national origin, age, disability or veteran status. 1104 West 8th Street Yankton, SD 57078 Immediate opening, full-time. Will supervise, plan develop and organize nursing services and activities. Will be responsible to train and recruit employees, monitor and evaluate performance and ensure operational productivity. Will participate in nursing schedule wherever necessary. Must have current SD license and CPR, ACLS and Pals certification. All qualified applicants will receive consideration for employment without regard to race, color, religion, gender, national origin, age, disability or veteran status. 1104 West 8th Street Yankton, SD 57078 IF INTERESTED, APPLY ONLINE AT: www.YanktonMedicalClinic.com/careers 1104 West 8th Street Yankton, SD 57078 1104 West 8th Street Yankton, SD 57078 IF INTERESTED, APPLY ONLINE AT: www.YanktonMedicalClinic.com/careers Nursing Supervisor Full-time position (40 hours per week) Monday through Friday. Assists patients with questions regarding their financial health care accounts. Monitors and reviews patient’s financial responsibility. Experience in billing cycles, customer service and collections required. Medical terminology preferred. . All qualified applicants will receive consideration for employment without regard to race, color, religion, gender, national origin, age, disability or veteran status. IF INTERESTED, APPLY ONLINE AT: www.YanktonMedicalClinic.com/careers IF INTERESTED, APPLY ONLINE AT: www.YanktonMedicalClinic.com/careers Full-time position Monday through Friday and rotating Saturdays. Will operate clinic switchboard and provide support with payment entry for business office. Must have excellent computer and communication skills. Attention to detail mandatory. Medical office experience is preferred. All qualified applicants will receive consideration for employment without regard to race, color, religion, gender, national origin, age, disability or veteran status. P?????? E?????? ? ??????? ??????? ????????? 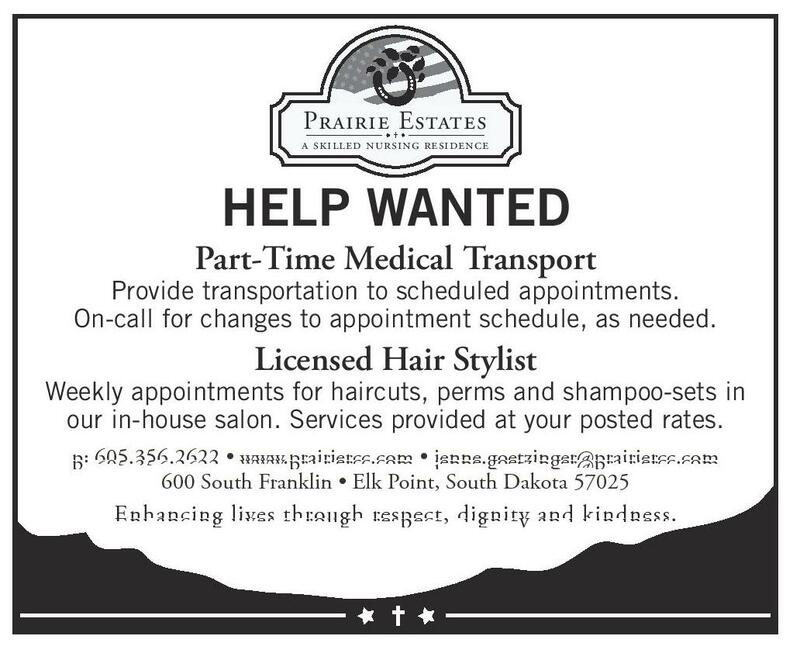 HELP WANTED Part-Time Medical Transport Provide transportation to scheduled appointments. On-call for changes to appointment schedule, as needed. Licensed Hair Stylist Weekly appointments for haircuts, perms and shampoo-sets in our in-house salon. Services provided at your posted rates. p: 605.356.2622 • www.prairiercc.com • jenne.goetzinger@prairiercc.com 600 South Franklin • Elk Point, South Dakota 57025 Enhancing lives through respect, dignity and kindness.